Here is a new vocabulary and facts set related to house places and items. Floors: In Japan, like in some other countries as the US for instance, the ground floor is in fact idntified as the 1st floor. Therefore if you are living at the third floor above ground floor in a buidling then you will say you are located at the 4th floor. At what floor is your apartment? It is on the 3rd floor. Japanese style living room: 茶の間 (chanoma) – means literally the place (間) dedicated to tea (茶). It is generally composed of a low table called 卓袱台 (chabudai) surounded with some floor cushions called 座布団 (zabuton). The whole sits over a set of 畳 (tatami), which are mats made of rice straw. Initially 畳 where quite thin and could be rolled over a wooden floor or directly onto the soil. They then became thicker around the XIIth century as they were used as a sign of superiority (lower rank people being still sitted on the ground), and little by little were used to cover the floor of some rooms, before being commonly used in every houses. 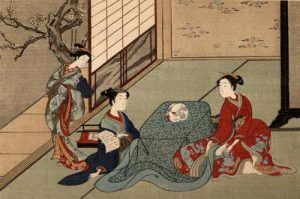 At winter you could also find 炬燵 (kotatsu) sitting in the middle of the room which is a table including a 布団 (futon) that covered an hearth into which charcoal was burnt to allow people heating there legs. Nowadays these tables are still widely used and include an electric heating system. For the note, the tatami is still used as a mean to indicate the surface of a room – for instance a room of the size of 6 tatamis will have a surface of 六畳 (roku jou). Previous PostVocabulary – Body parts – The headNext PostWonderLang’s KanaQuest v0.1 is out!